If you are interested in developing a mindfulness practice and the skills of becoming a counsellor get in touch today. At lotus training, we emphasise the development of mindfulness and open-hearted-ness. We regard these as an essential starting point for the processes of healing and growth. We understand well-being to be a truly expansive state of presence, compassion, joy and peace which can manifest in any aspect of our human condition, including suffering. Mindfulness practice is a regular feature of all our counselling courses. We use this as a resource to help support and nourish the helper, counsellor, and psychotherapeutic counsellor. It is an approach that you can apply in everyday life. We pay particular attention to aspects of mindfulness training such as awareness, equanimity, compassion and loving kindness. Developing these skills can help us to appreciate and access our ever-present inner awareness. Mindfulness is taught through meditation practice, which includes bringing attention to the breath and body in relation to self and other. Mindfulness is about paying attention, about simply being present with what is happening in an accepting and spacious way. The contemporary approach to mindfulness is based on Buddhist psychology and practice which is over 2,000 years old and yet integrates well within a human perspective on the value and potential of the self and a deep respect for the process of individuation. Whether you are studying at level 2, 3, 4 or 5, your personal development is an important part of the training curriculum. Our courses lead to nationally regulated qualifications awarded by the Counselling and Psychotherapy Central Awarding Body (CPCAB) – the only Ofqual-approved awarding body to specialise in the field of counsellling and supervision. We also run a dedicated counselling service. Psychotherapy Plymouth was established in 2005. 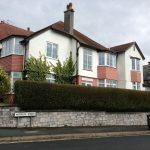 Our main counselling centre is based within Waterloo Well-being Centre, Plymouth. 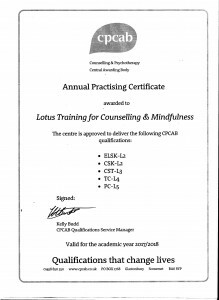 Recent feedback received from our External Verifier stated our Level 4 Mindfulness-based Counselling Diploma is ‘Outstanding and Exceptional’. Our courses are accredited by CPCAB. The only awarding body run by counsellors for counsellors.